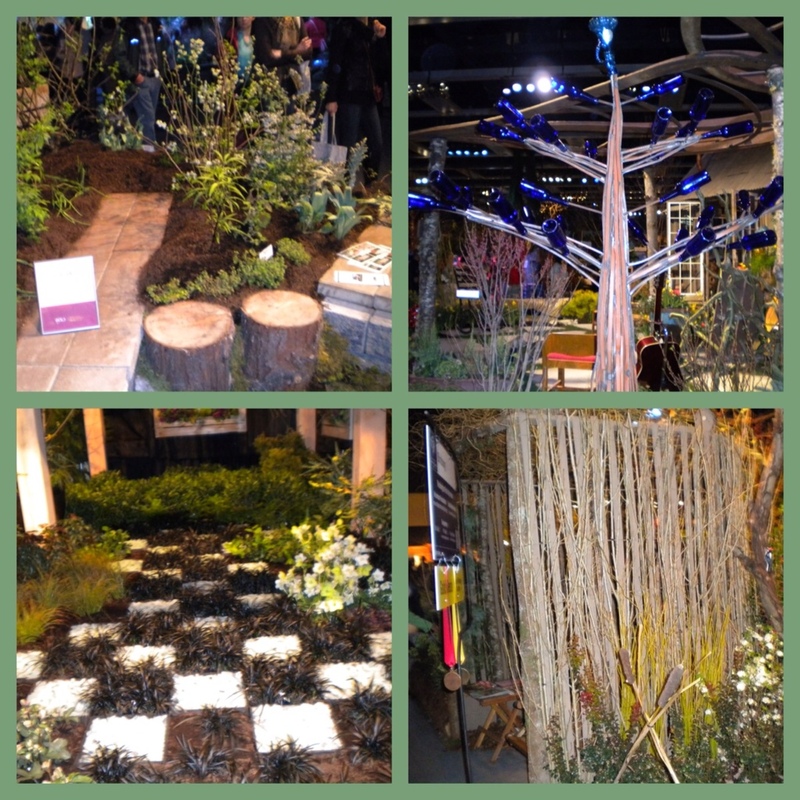 It’s Garden Bloggers Bloom Day this February, and I’m not quite done showing off the pictures I took at the Seattle flower and Garden show for Mosaic Monday. The first image is of the display garden that featured both ornamental and edible plants in its beds. The idea was to show that edibles can be beautiful too. The beds had lots of kales, herbs and flowering bulbs to show off. The garden had beds that fanned out with the wider part in back and paving stones in between for easy access. I really like this cute little checkerboard garden. The white squares were filled with white gravel, while the dark squares were done with black mondo grass. Edging the checkerboard area, where grasses and spring flowers. In the background was a pergola, which you can just barely see the feet. And in the last image you can see one wall of a hut, constructed of branches and twigs. I took a picture of this because I really liked the texture of the wall. Now back from Seattle I’ll show you what’s blooming in my garden, aside from my Raja boy looking out on last summer’s foxglove. 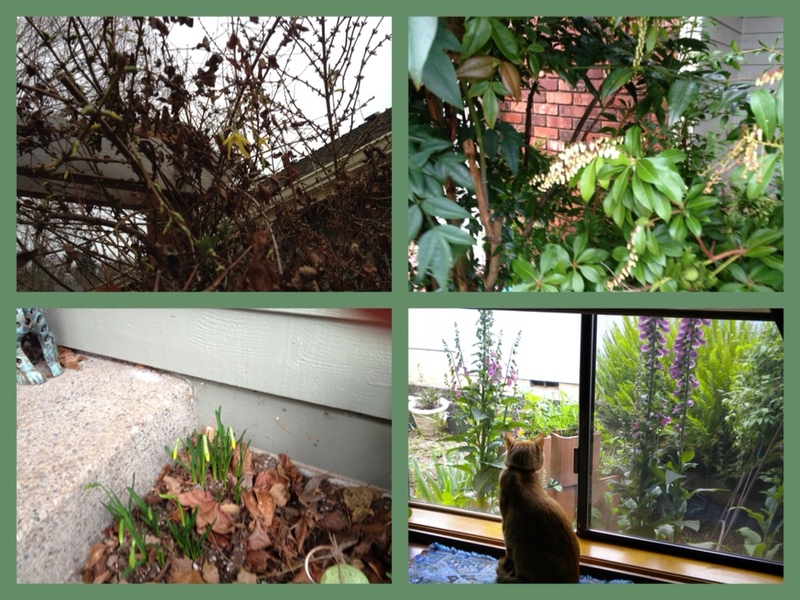 The first picture shows a few lonely blooms that my forsythia bush is starting to flick out. Can’t wait until this one is in full bloom, it is beautiful. My pieris bushes are a little further along and have a quite a few clusters of blooms in protected spots on the shrubs. Very fragrant. 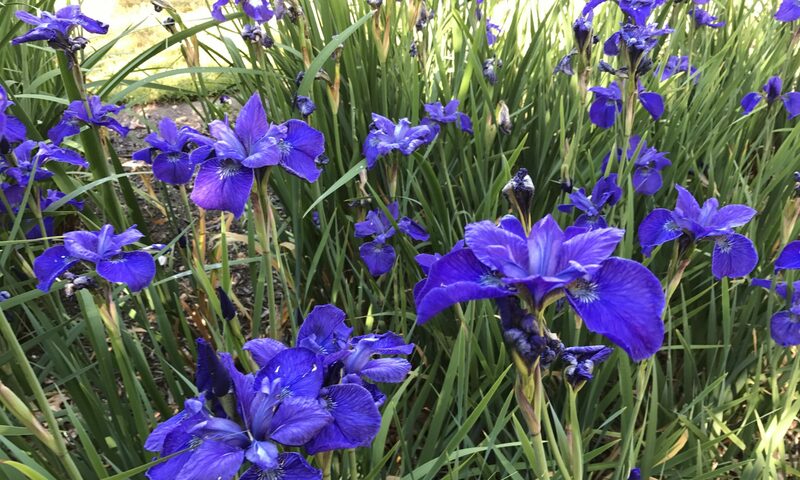 I can’t wait for these to come into full bloom, either. Lastly, my Tet a Tet daffodils are sending up buds and should be in bloom shortly. These are right by my door, so I can see them. Well, that is about it for Garden Bloggers Bloom Day this February and what is blooming in my garden. Thanks to May Dreams Gardenfor hosting this. Now I think I’ll go and see what some other people have going on in their gardens.